I posted this Instagram a couple of days ago and regretted it. Am I an adobo nazi? 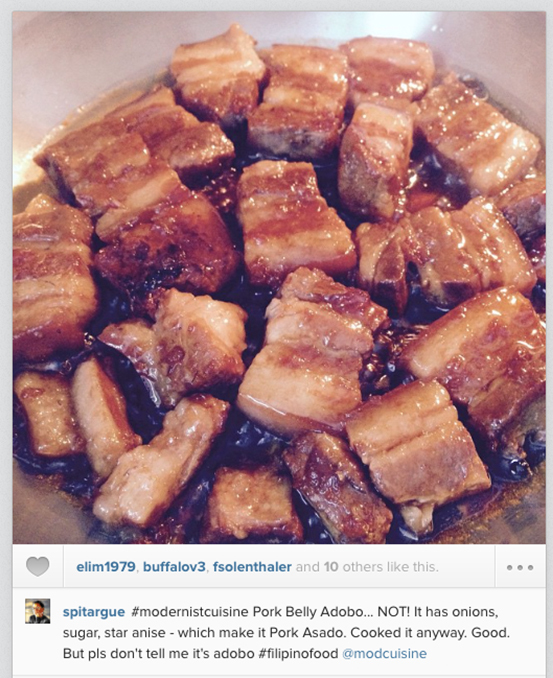 There it is, on page 224 of Nathan Myrhvald’s Modernist Cuisine At Home, the recipe for Pork Belly Adobo, “considered a national dish of the Philippines.” If there’s clear indication that Philippine cuisine – represented by our adobo – has hit the mainstream, this must be it. Unfortunately, the recipe was for pork asado, not adobo. Pork asado – while resembling the Filipino adobo in its use of vinegar – is actually a sweet pork dish introduced by the Chinese, distinct for its use of star anise, (or five-spice powder) and sugar. Sure, the adobo has seen various transformations and at times taken on Chinese ingredients like soy sauce, but pork asado and adobo are of separate provenance – just as our sour soup, the sinigang, is different from the Malaysian singgang. I feel it’s a distinction that’s important to make, if we are to present a national dish to the world. 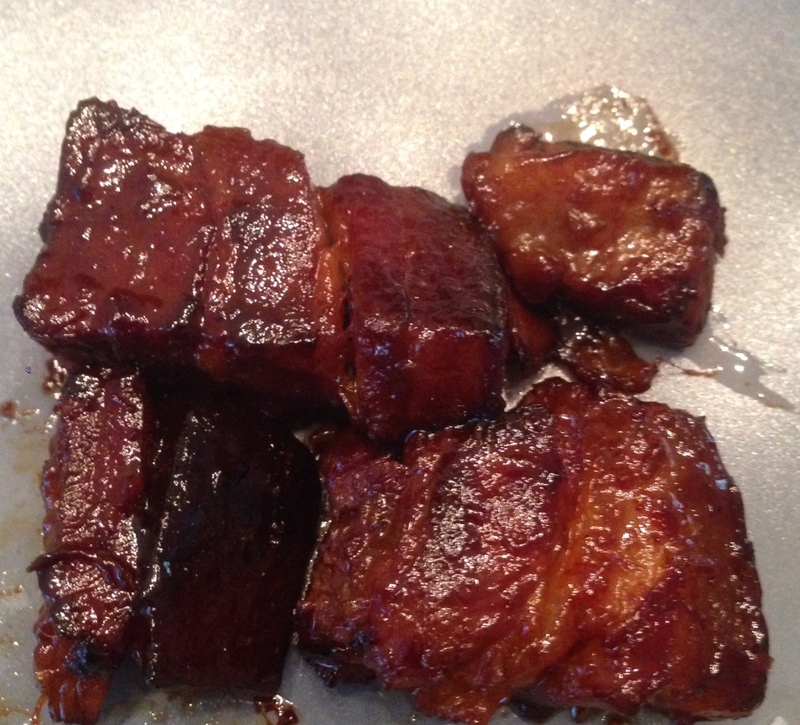 MC’s Pork Belly Adobo is actually an asado. Note distinctive crust of caramelized sugar. But, hey, it’s good! Not an easy job. To start with, a foreigner would often confuse it with the Spanish adobo – which is basically a condiment or seasoning – and the adobos of Mexico, Puerto Rico and Peru where adobo refers to a type of marinade or pickling sauce. And then there’s the asado, a Hispanic term for the Chinese dish that found its way to our tables, perhaps via the Parian, Manila’s “Chinatown” during the colonial times. In the Philippine context, adobo is not a particular dish with a specific set of ingredients; it is a method of cooking, one that is indigenous to us: braising meat in vinegar and salt. It predates trade with the Chinese, which according to records, did not begin until the 900’s. It certainly predates our colonization by the Spanish who, mildly reminded of their own adobo, gave it the same name, “adobo de los naturales”. Sadly, there is no record of how our ancestors called this “dish”, this method of cooking, our adobo. But for sure, it was very simple and austere – just vinegar and salt and maybe garlic, another preservative. We didn’t have royalty the way the Chinese and the Europeans did, for whom we had to cook, to please and impress. While we shared DNA as well as some maritime routes with the kingdoms in Java and Brunei, we were practically a cultural isolate – Filipinos were a people divided by water and more than a hundred languages. If there were variations on this adobo, they were mainly geographical: the addition of coconut milk in Southern Luzon where coconut was abundant; turmeric in Mindanao because of its proximity to Indonesia. The adobo has since transformed – or to be precise, become more embellished – in a way that reflects our history as a people like no other Asian dish I know. The addition of onions, tomatoes, bell pepper was an influence of Spain; potato, most likely from Americans. Similarly, no single dish has become a means to show off one’s status in society or level of sophistication: balsamic or sherry in lieu of vinegar; foie gras, because pork isn’t rich enough. Traditionalists assert that what makes “authentic” adobo is the triumvirate of vinegar, garlic and salt – no soy sauce, perhaps some peppercorn, and no more! The austerity of it has always intrigued me. Slow-braise, pressure cook, sous vide, deconstruct? How else do you make this adobo shine enough for the world stage? The answer is just cook it! On low fire for 1-2 hours, or until the pork fat melts. You’ll be amazed, just as I was, at how deep-flavored, dark and decadently rich it can be. And so simple, anyone can cook it. Our national dish it is!